Bonjour et bienvenue to the seventh issue of La Marmite. And on a more sober note, the vegetable of the month: Florence fennel. This year Mardi Gras falls on February 24th. To get you in the mood for this festive occasion, let's have have a look at how Mardi Gras is celebrated in French Guyana, a South American department of France. On the Catholic calendar, Fat Tuesday is the day before Ash Wednesday and the start of Lent, a period when sobriety and frugality need to be respected. In some places, including French Guyana, the whole period leading up to Mardi Gras has become a big party called Carnaval. At first glance, one might think that this was just a long, chaotic celebration, but in fact there are a number of rituals and rules that are respected for this annual blow out. Here's a taste of some of the characters you might meet up with in Guyane during the Carnaval period. Le Roi Vaval - This is a mythic king who is born on the first day of Carnaval and dies on Ash Wednesday. Touloulous - These are women dressed from head to toe in an elaborate costume. The rules state that not one bit of flesh can show, and if an undisguised woman takes to the dance floor, the band stops playing. Tololos - In recent years the men have come up with their own version of the touloulou tradition calling themselves tololos and indulging in their own bit of fun. Nèg'maroons - You're likely to catch sight of these near naked fellows who look like they just came out of a mud bath during the parades. Bystanders watch out! The tradition is for them to rub their oil and soot soaked bodies up against your own. La Mort - This character, representing death, is completely covered in a white flowing costume that allows him to cover up spectators. Diab Roug - These red devils appear on the streets for a special parade on the very day of Mardi Gras. 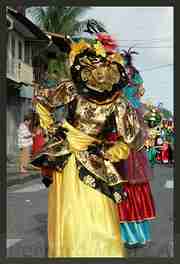 Every Sunday during Carnaval, a parade is organized in the streets of one of the big towns. In general people participate in the parade as part of a group. A theme is given each year, and various associations will spend months preparing their costumes. Not only are you likely to catch sight of some of the traditional Guyanese characters described above, you'll be treated to Brazilian dancing girls with feathers (and sometimes not even those), Amerindian groups, Chinese groups, and Indian groups as well. These parades are truly multi-cultural affairs. Skip through this video of a recent parade in Kourou to catch sight of some of these groups. Dances are organized by different associations throughout the Carnaval period. Each dance location has its own particular character and reputation. Be warned, ça peut chauffer! Many Touloulous and Tololos take advantage of their anonymity to heat things up a bit. Of course, Mardi Gras is celebrated all over France, not just in French Guyana. Each city has its own special traditions, but one thing almost all of these celebrations have in common is the beignet. These fired fritters are cooked up in large batches and distributed freely during parties and parades on Mardi Gras in France. Place the milk in a large mixing bowl and warm it in the microwave until just lukewarm. With a wooden spoon, stir in the yeast, sugar and salt and until completely dissolved. Stir in the flour, butter, eggs and flavoring and mix well. Knead dough just until smooth and then gather into a round. Place the dough in a lightly oiled bowl and cover with plastic wrap. Place in the refrigerator until chilled - three or four hours or overnight. Remove the dough from the refrigerator and roll it on an a lightly floured surface until it is about 1/2 inch thick. You can cut the dough into any shape you wish - diamonds are popular in France. Heat the oil in a sturdy pot (or use a deep fat fryer if you have one) until it is 360° F. Drop the beignets in the hot oil and cook in small batches, using metal tongs to turn them occasionally. They should take two to three minutes to be golden brown and puffy. Remove the beignets with the tongs and place them on folded paper towels to drain the excess oil. Sprinkle with powdered sugar if you wish and enjoy your beignets hot. Makes a couple dozen beignets, but it depends on how you cut them! Florence fennel is one of the vegetables that I discovered after moving to France. I didn't try it for a long time, but once I did, I fell in love with its delightfully light licorice taste. Don't think black licorice candy, this is much more mellow, especially when cooked. My favorite way to cook it is braised slowly in white wine where it softens into a slightly sweet side dish, perfect for serving along poultry. Next time you're at the grocery store why not pick up a couple of bulbs and get going on a new taste experience? Here are two fennel recipes to get you started. What's new at Easy French Food? Not so many recipes this month as I've been concentrating on kitchen equipment. Check out this handy list of kitchen utensils you are likely to find in the French home. Not so different from your own, I'm sure. But there are some things you may not already own that would add a new dimension to your meals including a French press coffee pot and French onion soup bowls. Cauliflower Au Gratin - Simple but good, and if you have a family to feed, this counts for the vegetable and will fill them up at the same time. Chestnut Dressing - A bit late for the holidays, but this is so good and since it uses canned roasted chestnuts, there's no reason not to try it anytime. Hope you enjoyed your Mardi Gras in France. Thanks so much for spending some time with me. In the next issue, due out on March 17th, you can learn about French Easter traditions.